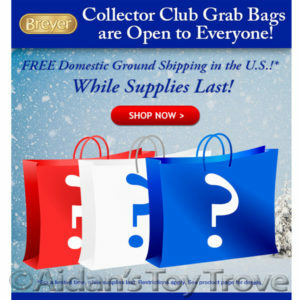 Breyer sure is pushing their 2016 Collector’s Club Grab Bags! They have opened the availability of the Grab Bags to everyone and are now offering them with free shipping. Breyer is offering 3 different Grab Bags. They are priced at $135 and Breyer says that each contains an estimated retail value of at least $219. « Breyer Horse Clearance and Sales!